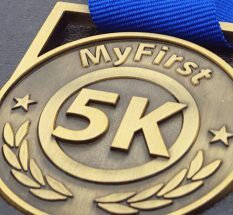 Do you remember how it felt to get your first 5k Medal? Can you still feel the thrill? The excitement? Do you remember what it felt like to walk around after the race with the medal swinging around your neck? For the past three years I have been helping to create that feeling for first time racers. Parents from all over the country have ordered My First 5K medals for their child’s First 5k race. Sometimes I get an email from Mom or Dad about their runner’s experience. Here is part of an email I recently received from one mother. I want to personally thank you so much for having the MY First 5K medal. I inspired my 6 year old daughter to train for her first 5K with the promise of a participation medal upon completion of the race. We trained 2 or 3 times a week running through the neighborhood. At first she really struggled with it, and I reminded her that she was working toward that medal that she wanted so badly. A few days prior to the run I discovered that the race we had signed up for no longer offered participation medals, and I was at a loss. That is when I found you. Not only did you have EXACTLY what I needed, but you also went out of your way to make sure that I received it in time. I can’t say enough how perfect it was to not only share my love of running with her, but also, at the end when she not only completed the race, but RAN the entire 5k, I had a medal in my pocket to commemorate this AMAZING moment. She was so happy, and felt so special, it was AWESOME. Life just doesn’t get much better then that. Angela’s comment captures why I do this. She was proud that her daughter stuck with the training and then ran the entire race. She was able to share her love of running with her daughter and then show her how proud she was. Just like their first step or first word, your child’s first race only happens once. It is a special moment that should be cherished. A medal is more than an object, it is a symbol of pride and accomplishment that your child will carry with them for years. When Angela’s daughter is off to college or making her way in the world, she will always have that medal to remind her that her mother is very proud of her. That her mother loves her and believes that she can accomplish anything she sets her mind to.